One of the things I love about holidays is family traditions. For Halloween, my mom used to make homemade donuts and hot apple cider for when we were done trick or treating. Thanksgiving is coming soon and there are certain foods (like my mom's water chestnut and mushroom stuffing) that HAVE to be on the dinner table. Christmas is pretty much the ultimate holiday for our little family and I love the traditions we have established. Years ago, my sister used to send us a handmade ornament every year for Christmas. Each one was different and several of them were personalized. I looked forward to getting those ornaments more than any present she sent with it. My kids can tell you that I'm the only one allowed to put those particular ornaments on the tree. You need to enter by November 19. Ornaments need to be mailed by November 25. I hate to set any sort of dollar amount guideline for this. Let's try to keep it handmade, if possible. Include a note with your ornament to tell the recipient how you made it, why you chose it, what it means, etc. This is a great idea! Unfortunately, I'm booked into my own swap and can't do this one too. 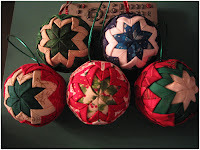 But I can tell you, it is the nicest thing to receive hand made ornaments!